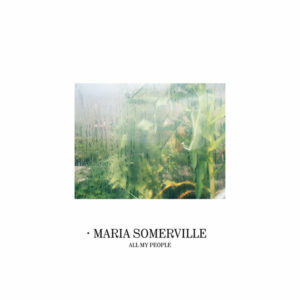 First surfacing in 2013 with a slew of festival shows and other assorted live outings, Galway’s Maria Somerville has taken the intervening time to craft this, her debut album. Back then her experimental blend of shoegaze, folk and electronica drew influence from both the barren landscapes of her native Connemara and her new urban base in the capital. Trading under her surname alone, she hadn’t quite found the mix, her murky, lo-fi pop very much a work-in-progress. Five years on she has retained that sense of push-and-pull between east and west coast. All My People is a quietly assured seven-track collection of atmospheric dream pop. It’s full of folk melodies torn apart, deconstructed and bathed in electronica, reverbed vocals and lo-fi, jazz-influenced guitar. David Kitt, Beach House and Katie Kim are among a range of disparate influences. There are nods throughout to Jon Hopkins at his most languid. Elsewhere ‘All Too Much’ brings to mind Jeff Buckley’s music at his most experimental, while Cat Power’s take on 1950s hit ‘Sea of Love’ is a close relation to Somerville’s ‘Dreaming’. Kitt is perhaps Somerville’s closest contemporary in terms of sound. Home-recorded, All My People retains the same intimacy as Kitt’s Small Moments and, like the Dubliner, Somerville is at her best when her electronica textures compliment rather than overshadow her unhurried melodies, such as on standout tracks ‘Eyes Don’t Say It’, ‘Dreaming’ and ‘This Way’. That said, there are occasions when Somerville gets lost in these textures to impressive results. ‘Undoing’ is wondrously claustrophobic and atmospheric. Similarly, ‘All Too Much’ shimmers, a tiny fragment of vocal melody piercing her mumbled singing. It doesn’t always work. Closer ‘Brighter Days’ sounds a little under cooked, but for the most part this is a debut to get excited about what Somerville does next. Hopefully the wait isn’t as long.